A call by the Anti-Racist/Anti-Fascist Response Committee of Solidarity Across Borders. We encourage organizations to endorse and share this callout, and to mobilize their communities and contacts. Get in touch if you can support this mobilization. UPDATE: Deadline for bus reservations extended until 10pm tonite (Friday, September 29)! Due to the number of reservations we’ve received, we’ve booked an extra bus! We can extend our deadline to reserve a space on our buses to 10pm this evening (but book as soon as possible as we will close reservations once we have filled the bus). E-mail solidaritesansfrontieres@gmail.com to reserve, mentioning, if applicable, any friends or contacts you know who are also attending the demo. See you Saturday at the border (Lacolle). – Buses and cars leaving from Montreal at 8:30am sharp. Get in touch for departure details. – Help MOBILIZE for this demonstration! Contact us at solidaritesansfrontieres@gmail.com so we can share with you our posters and flyers and other materials. Welcome Migrants and Refugees! Say no to racists!This demonstration at the border will express support and solidarity with recent refugee arrivals, with the clear message: Welcome Migrants and Refugees! Say no to racists! 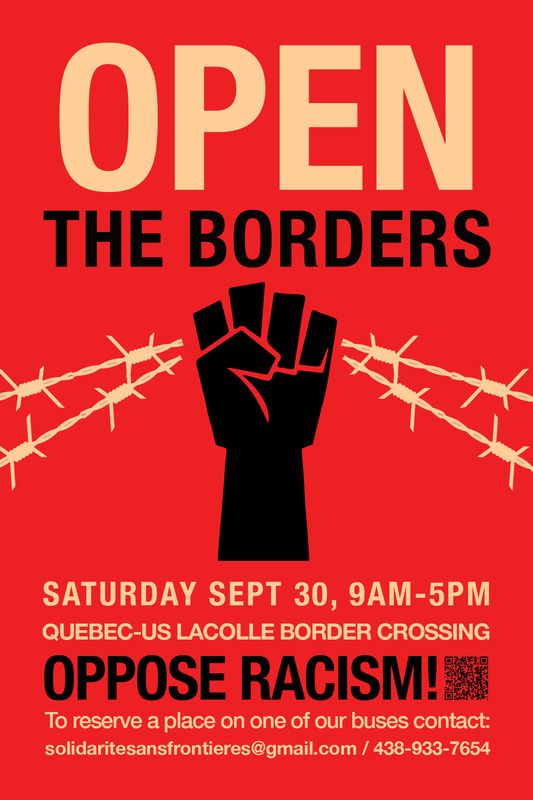 We encourage the participation of all who support migrant justice and seek to oppose the far right.We also demonstrate to reject the racist discourse that contrasts migrants with the homeless and poor already living in Quebec. We call for a linking of the struggles of all oppressed, poor and working class people against the rich and privileged. Instead of blaming migrants for exercising valid choices, we focus on opposing and resisting systems of oppression, specifically colonialism, patriarchy, racism, and capitalism.We campaign to build a Solidarity City, the creation of a community that rejects a system that engenders poverty and anguish, not solely for immigrants and refugees, but also for others confronting these same realities. We support open borders and the free movement of people seeking justice and dignity, meaning freedom to move, freedom to return, and the freedom to stay.Racists and Fascists: No Pasaran!